I’m a bit fuzzy one the origin of that credo—some say that it dates to Immanuel Kant, others all the way back to Aristotle—but the point is a valid one. And today, we got some proof in the Paste office: “Cherry Cola” flavored Oreos. And also some “Piña Colada” and “Kettle Corn” Oreos as well. All three are the result of the brand’s #MyOREOCreation contest, which announced that the flavors were inbound at the end of 2017. They all hit store shelves on April 30, 2018. So without further ado, here’s our breakdown after tasting each. On paper, this seems like the least expected and most out-there of the flavors. It’s not surprising that they chose to do them with golden Oreos, as the vanilla-flavored cookies are more natural bedfellows for coconut and pineapple than contrasting chocolate, but it is a little bit surprising that they chose to do this one entry as an Oreo Thins rather than a standard filled Oreo. The result is a cookie that sort of half commits to the theme rather than fully jumping into it. Put one up to your nose and you’ll certainly smell some coconut, although the pineapple is harder to detect. On the palate, you’ll get a bit more of the citrus, although it almost seems more lime-like than pineapple. I wouldn’t have expected to be typing this, but these could really have used more of the creme in each cookie to allow the flavors to be more easily perceived. The Oreo Thins format simply puts too much focus on the wafers, rather than the creme. Most tasters agreed that this was ultimately the best of the new flavors, but for reasons of bland familiarity more than anything else. Unlike Piña Colada (and especially Cherry Cola, which we’ll get to in a moment), “kettle corn” is barely a stretch at all for the Golden Oreo base, as they already contain a lot of the same buttery, vanilla, and lightly caramelized flavors. Ultimately, this one is just fine: It’s a bit more nutty and a bit more caramelized than normal, but if you handed a few of these cookies to someone and said “want a Golden Oreo?”, there’s a 90% chance they’d simply eat them happily and never even notice that there was supposed to be a “kettle corn” theme at play. We’ll finish this package, but that’s mostly because they’re Oreos. Here’s where everything goes terribly wrong. The only entry in the #MyOREOCreation contest to be made on the (superior) chocolate cookie base, the “Cherry Cola” flavor ends up coming off like some kind of crazy flavor experiment born in a test tube. Nothing here works, and the Cherry Cola Oreo flavor is ultimately a victim of trying to cram way too much artificiality into a familiar package. We feel sorry for the people who will end up buying this at the store. 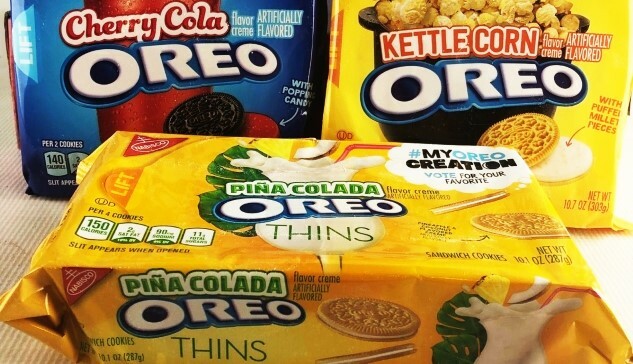 Ultimately, of the three flavors we can only give a tepid recommendation to the Piña Colada and Kettle Corn Oreos. The first tries to do something interesting but doesn’t make its flavors available enough (because there’s not enough creme). The second plays it very safe by making a product that might as well be a regular Golden Oreo. The third … well, let’s not talk about Cherry Cola Oreos ever again, alright? That one needs to be swept under the metaphorical rug where failed brand extension ideas go to die. And if you’re the fan who designed the Cherry Cola Oreo flavor: Shame on you. Jim Vorel is a Paste staff writer and resident Oreo taster. You can follow him on Twitter, if serious-minded cookie reviews are the sort of thing you enjoy reading.